Overwatering African violet plants can lead to disease, such as root or crown rot, and can also cause denitrification in the African violet, which occurs when the violet is robbed of nitrogen that is vital for its survival, according to the Optimara website. 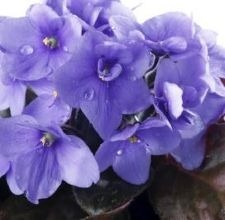 By keeping your African violet plants properly watered, though, you can have healthy violets that continue to thrive and bloom. Leave water sitting out to warm to room temperature. According to Optimara, cold water can cause African violets to chill, leading to curling of the leaves. Fill a plant saucer with the room temperature water and set the African violet’s planter into the saucer. If you do not have the African violet planted in a planter with holes in the bottom, replant the African violet into a planter with holes. Leave the African violet planter sitting in the water for up to 30 minutes. After 30 minutes, remove the planter from the water even if all of the water has not been absorbed. Water your African violet plants again once the soil feels dry to the touch. According to the Dixie African Violet Society, the proper watering schedule for African violet plants is approximately once per week. According to Optimara, the goal is to keep the African violet plant’s soil moist at all times, but to never make the soil soggy. Do not use tap water for your African violets if you have soft water. According to Optimara, soft tap water can have a negative effect on the growth of the plants. Over-chlorinated water can also be detrimental, but you can remove chlorine from the water by allowing the water to sit out for 24 hours before using it. 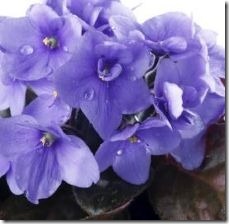 Avoid getting water on the leaves of an African violet plant. According to Optimara, getting water on the leaves can lead to spots that cannot be removed.